First-time buyers often experience stress when selecting the perfect engagement ring. Many diamonds, precious metals, and gemstones exist to provide the perfect proposal. When deciding upon the perfect style, look, and size, the perfect wedding ring deserves nothing less than top-quality selections. When a relationship reaches the next step, it’s time to make a choice. The following wedding ring trends have directed many individuals, and they’re perfect for the partner seeking perfection. The round diamond is undoubtedly the most popular diamond shape in the world. For maximum fire and sparkle, the round brilliant cut diamond is the top pick. It will never go out of style and it’s popular choice for traditional and modern couples alike. The round brilliant has been and will always be the number-one selection among future brides and grooms. The future is here, and gold needn't be a relationship’s only definer. Although gold has always been the go-to metal choice because of its durability, platinum has become one of the world’s favorite fashion metals. Platinum has found its home within engagement rings, and newly-weds have thanked the metal’s existence. Another popular metal choice is rose gold, a mixture of yellow gold and copper, which has a subtle pink tone that brides have come to adore. Rose gold makes a great choice for the romantic bride or if you're looking for something special. Side-stone engagement rings have re-affirmed such a focus, and their display exemplifies a wedding ring's prime display. Side-stone rings compliment the center diamond and add additional side-sparkles to flank the main display. Choose from dainty side-stone solitaire rings or slightly larger side-stones to compliment your center diamond of choice. 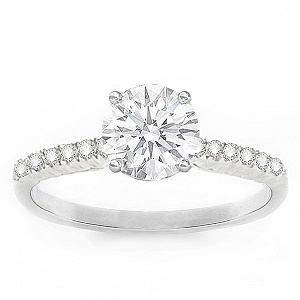 Classic solitaire rings had a great benefit: The center diamond is its main appeal. They have made a re-emergence, too as the style’s simplicity boasts elegance and timelessness. A diamond solitaire, although simple and refined, directs focus to the center stone. While many other trends exist, today's couples are opting for a simpler, sophisticated design. While every wedding band boasts a variety of unique attributes, modern trends reflect culture and widespread needs. Before selecting a ring style and diamond shape, remember to exemplify a relationship with a loving and caring approach. Many options exist, and many can facilitate a ring perfect for “The One”.